I don't know about y'all but I just love boxwoods. 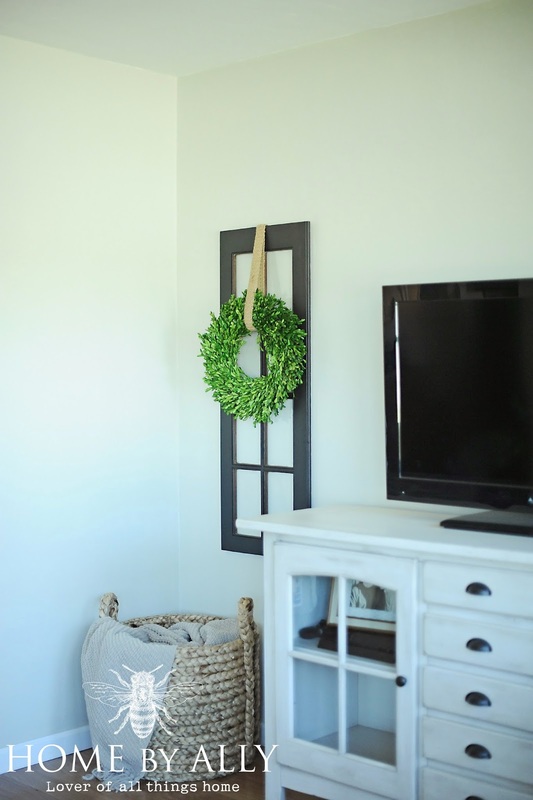 Something about them in rooms makes it feel fresh, inviting, calm and adds a nice pop of color! I knew I wanted something with a little bit of height but that was slim line and skinny for either side of our new tv stand. 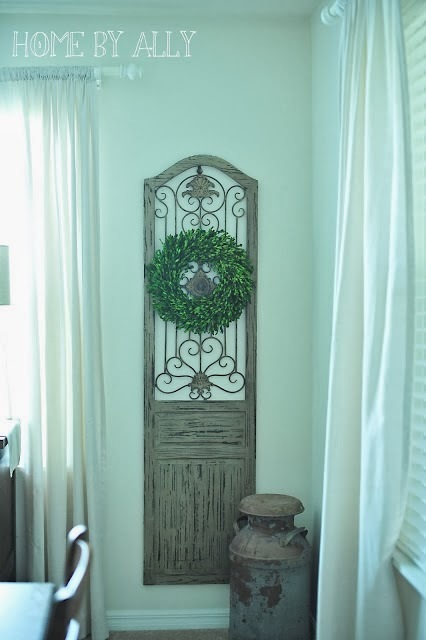 Originally, I was going to use my gates that I had back in the dining room of the old rental house. 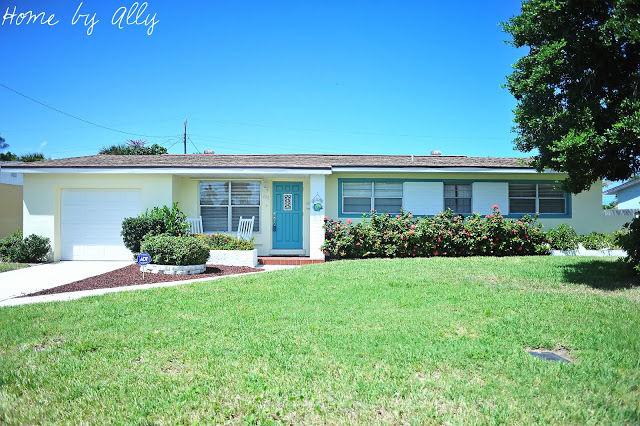 To see the home tour of our old rental, just click here. Well I posted the gates for sale on my Facebook page but they are available right now for $150 for the pair. Here's a photo of them below. I also was going to post our old Ikea coffee table and end table set but they sold within a few hours of me putting them on Craigslist which is always a blessing. They were a cute set and I hope they work for the next person as much as they worked for us. Since we moved into our home, I've been craving a house that I've dreamt of. I'm just "over" keeping stuff that I don't really love. So if you're local, you may have noticed that I have been purging. A LOT. I used to have decor closets that I could go to and switch things out. Well, my decor stash is down to a mere little pile and I am proud to say that. 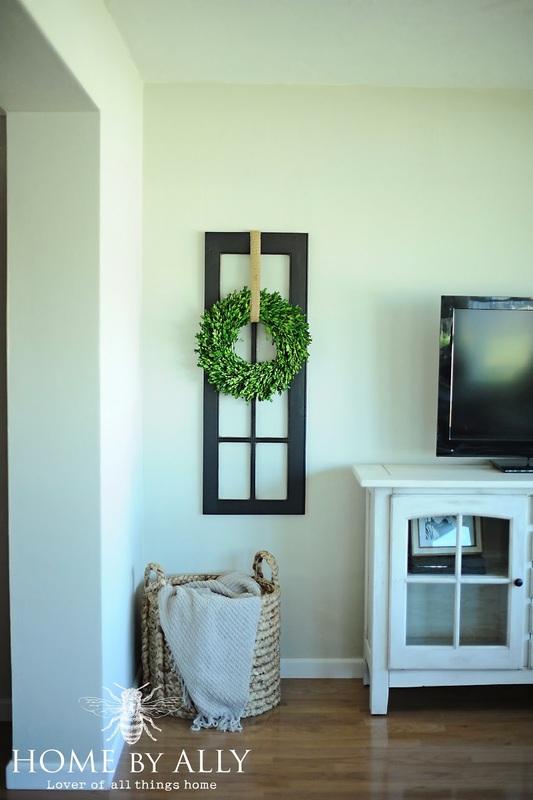 The things that are in your home should reflect you. They should reflect a memory you love and don't want to forget. Or someone you love dearly. I don't want to keep stuff just because I got it on clearance or because I may use it "someday." If you haven't used it in a year, chances are you probably are not going to use it period. And y'all, let me tell you first hand how rewarding and FREEING that it was to purge. 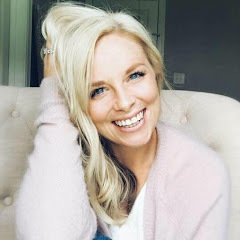 I feel so much better already and I am starting to slowly love my home as I've been slowly adding things that speak to me, things that I love…and am crazy about… you should try it sometime. It really is good for the soul. I fell head over heels in love with the tv stand as soon as I saw it. My favorite part are the middle drawers and the cupped hardware. Drooling over here. The window were raw wood so I painted them a matte black. I've always loved black in interior design as it is a nod to traditional design. I'd like to think I'm traditional meets cottage meets farmhouse. Ya like that don't you? 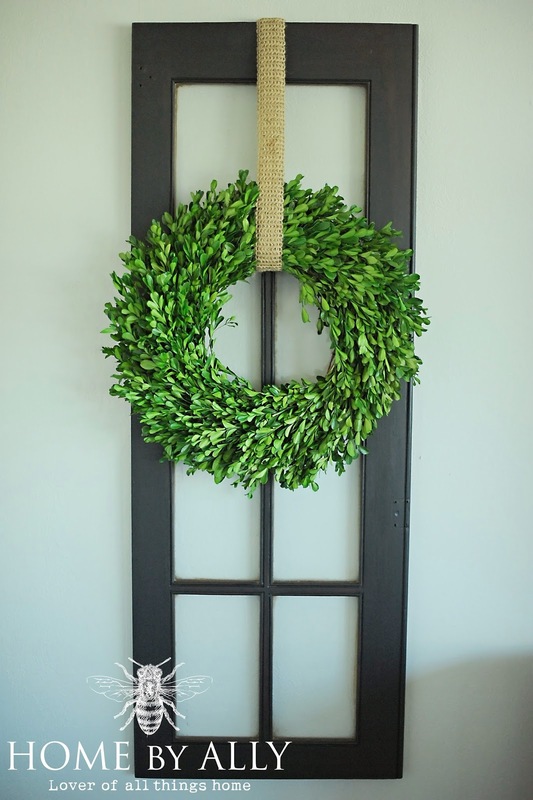 I added my signature boxwoods…and of course love them. 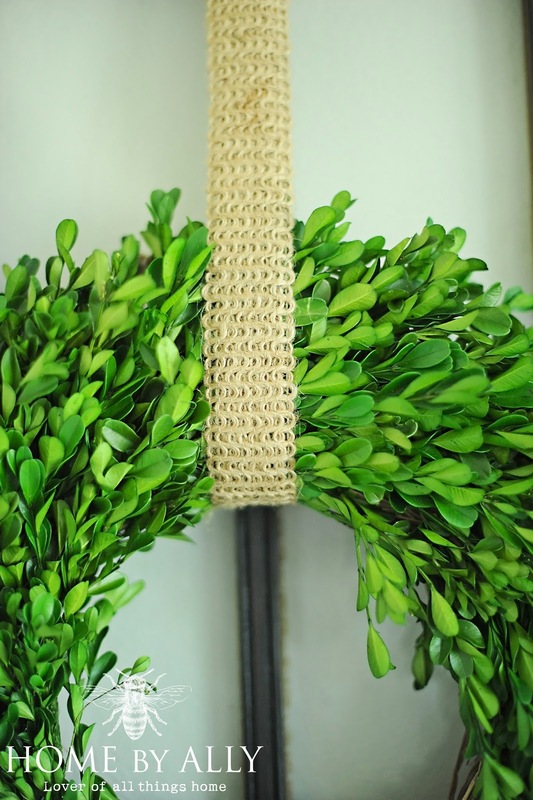 I hung each wreath with one inch thick burlap ribbon that I found at GoodWill for two huge rolls! 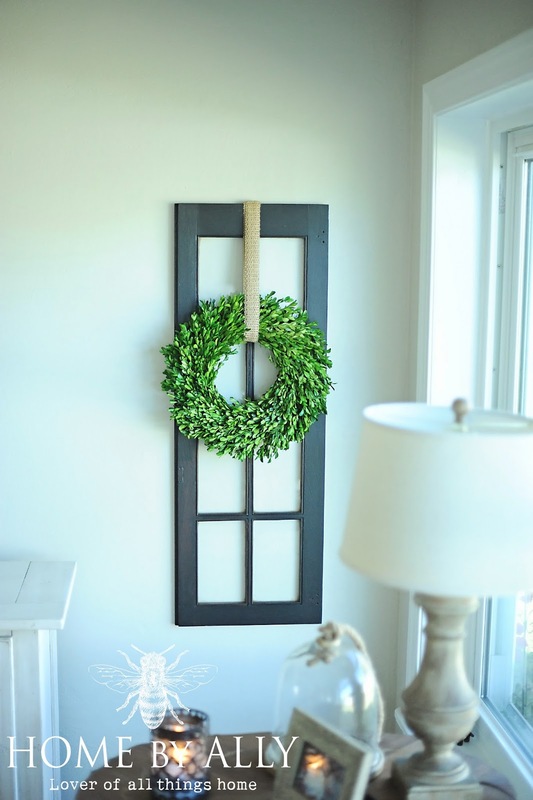 I love the contrast of the window against the wall, the wreath against the window and the burlap against the black. Here's a view looking directly in front of the tv stand. As I mentioned before, since I purged, I no longer can go find whatever is in the guest bedroom to fill my tv stand so slowly, I will fill it with things I love. I'm on the hunt for some baskets for the lower half though to hold games, toys, etc. Oh and in case you are wondering…and I know y'all will appreciate my awesome photoshop skills below! I do have a plan for something about the tv. Originally I thought of doing a small plate wall and using plates that I could customize with quotes or something true to me. Now, I am thinking I am going to make a custom pediment to go above it trimmed out at the top. Something to the shape that I tried to draw in photoshop. I'd like it to say something short, sweet and something that makes me smile every time I look at it. The only thing I keep thinking for it to say is "Life is Good" in cursive or another language. Simple enough right? Just wanted to show y'all this quick update. I've been going through clothes for the past few days to list on Ebay. If you know me personally, you would be so proud of all that I have gotten rid of, donated and sold. A couple of weeks back, I took 4 different SUV loads to a thrift store to donate. Talk about feeling good about yourself, right and helping others… it really is the best feeling. I like the way you've changed things, I am so sentimental it's tough for me to get rid of things! Can't wait to see what you do next in your home, I need to come to the Wildwood Mall and check our your booth too. this is so so charming! visiting via MMS and hope you'll visit me back: http://hellolovelystudio.com. I'm guilty of that as well. I tend to hold on things I never use just because I like the way they look. I guess I should follow your lead and sell those things to free up space and earn money at the same time. Anyway, your new window panes look lovely. It makes the wall around the TV set look refreshing. Ally, You gave me a solution to my living room puzzle! I have two huge "windows" with ironwork in at, and they always felt a little bit blah to me. 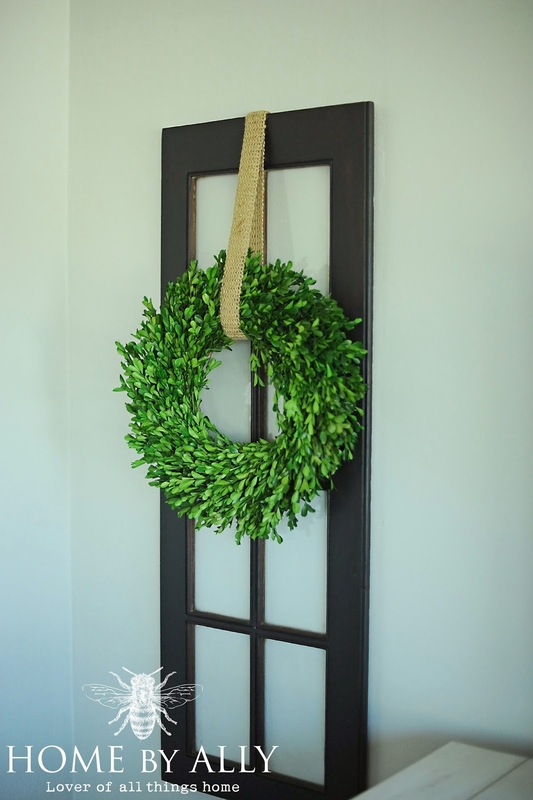 I love the idea of hanging wreaths on them, like you did on your windows. Thanks! I would love to have you come share your great ideas at my link party. The very first one is this Friday, Jan 31st at FlyingC-DIY.com. Hope to see you there! Gorgeous!! 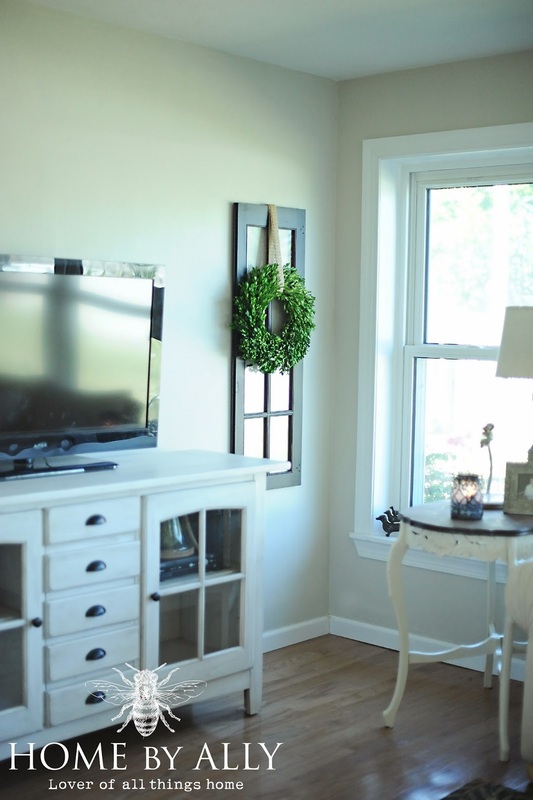 Love boxwood wreaths :) where is the TV stand from?? Love it!! Wow this is indeed a great home you have. i love the colors that you have used and so does my wife and children. 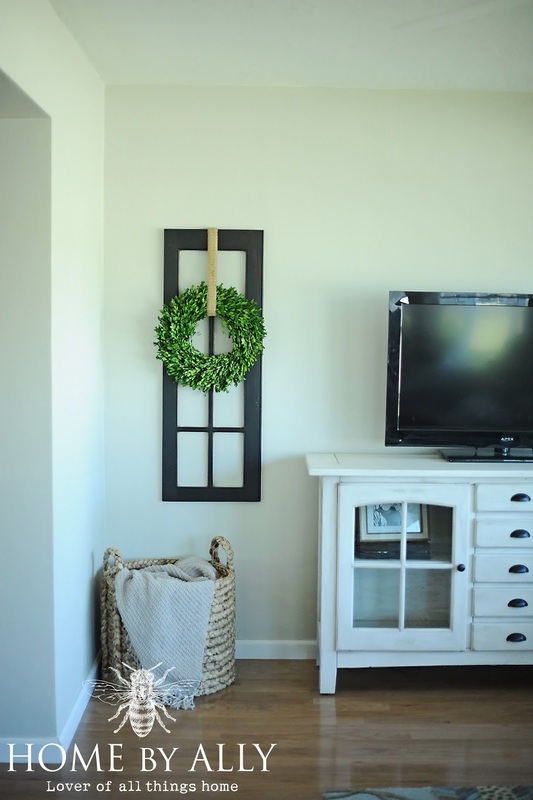 This has inspired us to use the colors in our own new home. We moved just recently and still have a lot to do before we can call it a home. Thank you for sharing this. I liked a lot of interesting content.